SAHM Ramblings: Would You Buy This Cookbook for 25 cents? Hilarious. 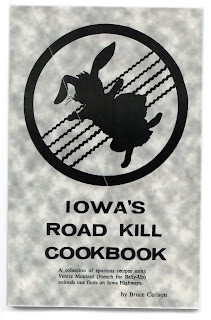 There's another book like this on Texas roadkill too that's pretty funny. Something called "Beer in the Rear Chicken" which involved placing a choice can of Schlitz instead of stuffing in...yeah, you get the idea. At least four suggested ideas on baked armadillo, et cetera. Seems like a good place to start for girls' lit would be Laura Ingalls Wilder...Secret Garden...Caddie Woodlawn...Witch of Blackbird Pond...Alice in Wonderland...CS Lewis...and Black Beauty. My horse-nut sis would kill me if I didnae mention Black Beauty. Sorry. Lit Geek. I'll stop now. Funny post. Thanks for the really kind comment you left on my uncomfortable post. I know it wasn't fun to read, but I'm glad it was good to read. This, by the way, is hilarious. I don't know if I'd actually COOK anything out of it -- but I would have had to buy it just for the giggle value. And then I would leave it in a conspicuous place the next time I had people over for dinner, and not say anything at all about it, just to see if they'd bring it up. :) But I'm silly like that. I would totally buy that book, and leave it sitting on the counter every time I invited friends over for dinner. I haven't found a decent book sale in a long time. . . it is ALWAYS worth it when you do. It would totally sell in Texas. Jamie Oliver just did a show on wild 'game' and used pigeons (rats with wings) in a lot of dishes---gag! EEEWWW I would so buy it and bring it out when people (you know, those people who invite themselves) come and show no signs of leaving when dinner time is approaching. I might share it with invited/wanted guests as a good laugh though, lol. I've seen this cookbook before but I have never ventured in to see the recipes. Sonny - Thank lit geek. I hadn't even thought of starting to read any of those to the girls yet. I'll have to test the waters! mommytime - I doubt I'll be cooking anything out of this book and yes, the giggle factor (and blog fodder) is EXACTLY why I purchased it. pb&J in a bowl - Yup, it's destined for a counter next time someone is over. Preferably someone that hasn't figured out our sense of humor! Tara - I don't think books like this help scare off those people who invite themselves over. Michele - You'll have to check with your local libraries. I've enjoyed every sale I've been to. Chaos and all! Cassie - It's stuff like "Scalloped Chipmunks" and "Interstate Potluck".